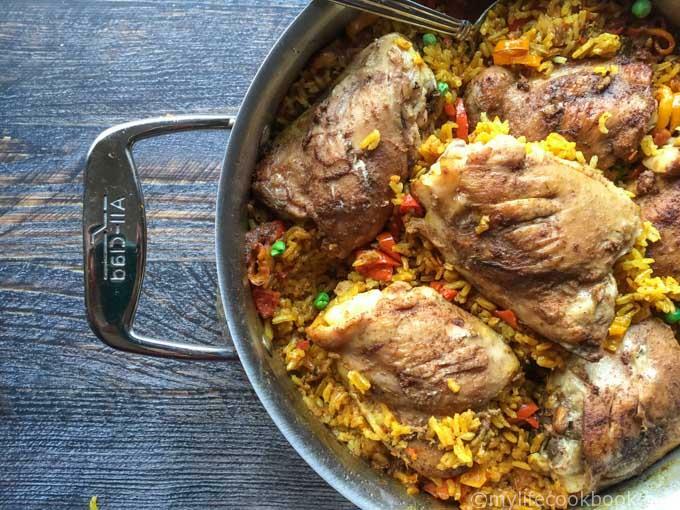 This chicken and Spanish rice dish is a simple one pan meal that the whole family will enjoy. 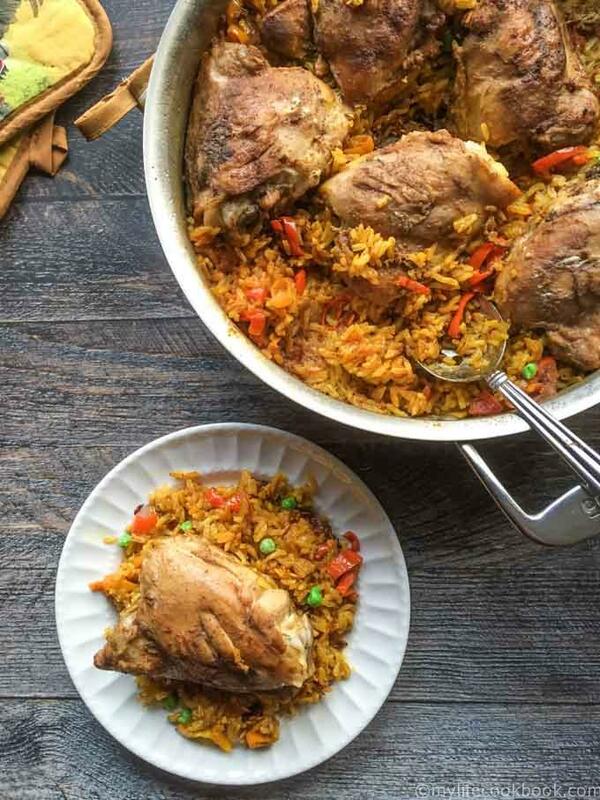 I used to make something similar to this chicken and Spanish rice dish a long time ago. After my mother passed away, I used to cook for my father, as did my sister in law and sisters. This was an easy dish that he liked and one that I could make with my limited cooking skills. I just remembered it the other day and thought that my hubby and son would like it as well. I love one pan dinners when I don’t have much time to cook and it always helps when my family loves them too. I am using chicken thighs again. They are becoming my go to type of chicken. They are inexpensive and they don’t dry out as easily as breasts so I buy them just about every week. However if you prefer chicken breasts they would work too. This is a rather simple recipe. You start by rubbing some spices on your skinless, bone-in chicken thighs and then brown them in a large pan. Take them out and saute some peppers, onions and garlic in the pan. Then add your rice, broth, spices and tomato sauce to the pepper mixture. Mix well and add the chicken back to the pan and sprinkle your frozen peas over top. Cover, cook and eat. Easy, right? My dad loved rice so I grew up eating a lot of it. I still eat it often with our meals and luckily my hubby and son like it too. Both really enjoyed this dish and I liked how easy it is to make. If your family are rice eaters too you might also like my Green Bean Stew. 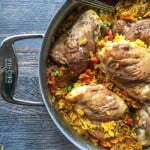 I hope you like this recipe as much as we do and please let me know if you have any one pan meals you’d like to share. Enjoy! 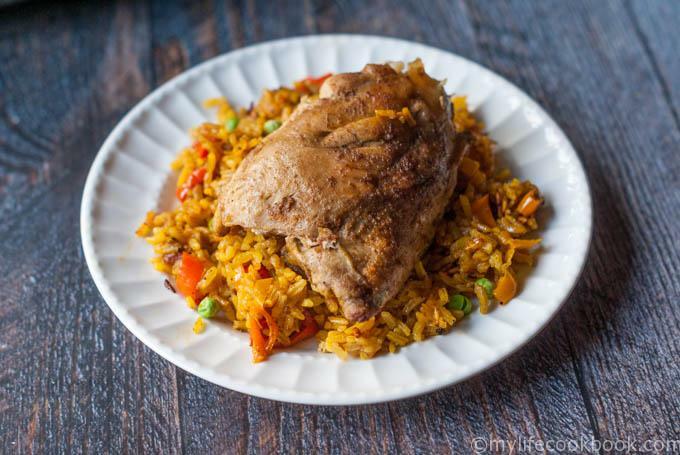 This chicken and Spanish rice dish is a simple one pan meal that the whole family will enjoy. Mix the salt, cayenne, garlic powder, paprika and cumin in a small dish. Rub the spice mixture on both sides of the chicken. Heat your pan to medium high. Add your oil and then brown the chicken thighs. About 5 minutes on each side. Take the chicken out of the pan and add a tablespoon or two of water or broth and scrape the brown bits from the bottom. Add your onions and peppers and saute for a few minutes until they start to soften. Add the rice and mix well with the peppers and spices. In a small bowl, add your broth, tomato sauce and turmeric and mix well. Add to your pan and mix everything once more. Add the chicken back into the pan, sprinkle in your frozen peas, cover and lower the heat to medium low. 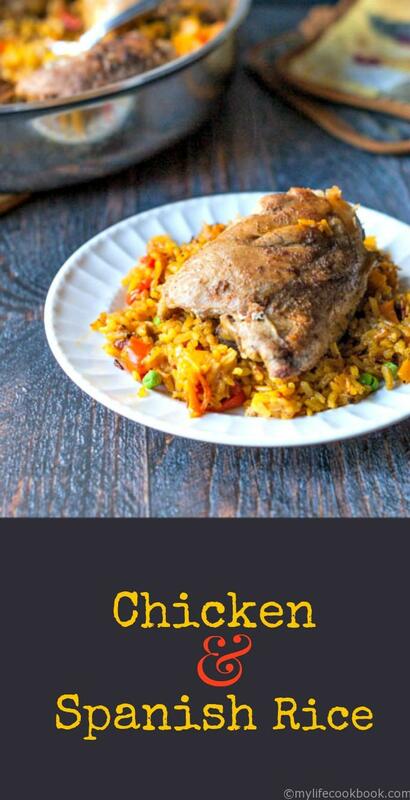 Cook for 30 minutes or until both the chicken and rice are cooked through. Delicious. The whole family asked me to make it again – before we finished our meal! Thanks!!! So glad you liked it! Thanks for taking the time to come back and comment. I appreciate it! I love simple flavorful meals like this. Pinning. Looks so good! I love one pan meals, the clean up is so easy, this sounds like a delicious combination so I can see why it was a favorite of your father’s, it would be a big hit at my house too! This dish sounds really tasty and it has some kick too! Gotta love a little kick! I have tried to butcher a whole chicken before and let me tell you, that’s what I did….butchered it. It was a mess. My father in law was a butcher and he tried to show me but I need more practice.